On Friday the 8th of November we drove up to North Wales to practice climbing in the Beacon centre for the open welsh championships climbing competition. I trained hard by leading and top roping hard climbs. I got a bit frustrated with one climb because it was so crimpy and you had to have amazing balance to complete it. My dad and brother gave me some advice and I managed to do it after trying each part on its own. When the day of the competition came I was very nervous but managed to top the first three with no problems. 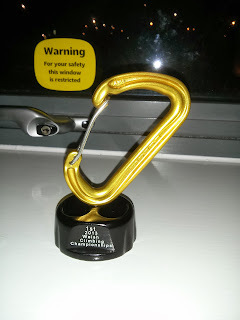 I qualified for the semis where I was put into isolation with 5 other climbers who also qualified. I found this semi final climb easier than it looked and followed my route read exactly. I qualified for the finals in joint first place. When I was reading this last route it looked hard. Finally I was called to do this route. It was a high yellow one. I tied myself in, chalked up and started to climb. I really climbed my best trying to complete every move. There were only 3 or 4 moves to go when I got tired and slipped but managed to hold on. It shocked me so much I tried my ultimate hardest to finish it and I managed to. I was so happy. My dad said it was my best climb I have ever done. Me and the other competitors shared our scores and I had won. I felt amazing I said well done to the girls and told my dad and little brother the news they were both thrilled for me. When all the categories had finished climbing Mark announced the winners and presented us with our trophies. I really liked the boys D category semi final climb so I decided to try leading it, I got half way no problems then it started to get harder and harder but I climbed it well and focused hard that is how I got to the top!